This is the third in a series, following up on my initial post about the ways in which SDPs are currently evolving along various axes. The second post was about the geographical axis; this one is about how SDPs are growing across asset classes. The first successful web-based trading offerings were in retail equities. But the starting point in the institutional space was in the OTC markets, whose relatively recent electronification has allowed them to leapfrog exchange-traded instruments when it comes to delivery technology. Over the last decade, OTC dealers have increasingly found themselves with scalable electronic liquidity but without a natural screen-based route to market. 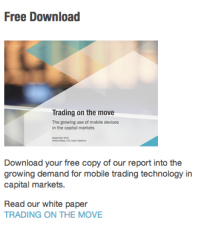 Multi-dealer platforms such as Bloomberg, TradeWeb and FXall provided a generic answer, but banks wanting a differentiated offering and a direct customer relationship found themselves naturally drawn to the Web as a direct delivery channel. Within the OTC markets, by far the fastest growth has been in cash FX trading, where last year SDPs captured 38% of trade volume compared to just 20% for MDPs. the market is so liquid and the barriers to entry so low that almost any bank can now, in principle, provide the liquidity its customers need. There is no doubt that SDPs are now firmly entrenched in FX, and increasingly common in FI (despite the Dodd Frank turmoil — or in some cases because of it, as banks search for strategic safety nets). It now looks as if FX spot, forwards and swaps are almost certainly going to be exempt from Dodd Frank. FX options trading, as a natural extension of the cash FX business. All of these are highly active areas, although the third is likely to be seriously affected by Dodd Frank. While retail equity trading was the first asset class/sector to move to web-based trading, institutional equity trading is at the back of the queue — mainly because the existing leased line/FIX/OMS infrastructure, while dated, still works well enough for most purposes. But there are signs of cracks appearing, mainly in the grey area between high-end retail and low-end institutional, and particularly in emerging markets. Family wealth funds, for example, even when quite large, often want trading as a service rather than having to install a lot of infrastructure. Coming next: the Provider axis. Just who is offering SDPs these days?